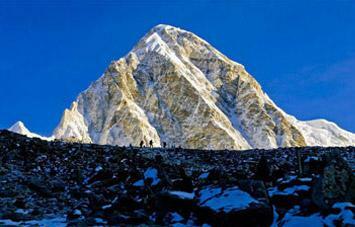 Adventure Pilgrims Trekking never say you are experience trekkers. But some other company ask the this trip is for experienced trekkers only, it is not true when you do not start how you will be experience?? We have designed this itinerary for every one!! We have built the itinerary in such a way the you'll be experienced trekker by the end of the trip.The Everest Gokyo Lake Trekking itinerary offers a challenging route to Gokyo in Everest Region.The Gokyo Lakes route to Everest Base Camp Trek offers a more serene view of the Himalaya and Everest. The Goyko Valley is noticeably quieter and unspoilt, far from the madding crowd on the Everest Trail. Due to the strenuous nature of the triple always deal with private groups and individual trekkers and travellers to ensure you get the plenty of personal support from our trek staff. We have designed the trip to ensure that you have acclimatization days in Namche Bazaar and Gokyo – at high altitude, this can make all the difference. We know that a network of local trek staff can be a great support on any strenuous trek. You’ll have an experienced Local guide, a senior assistant leader of similar capability, up to three guides and one porter for every two passengers, to ensure that you have a hearty team full of friendly and knowledgeable faces to assist you along the way. We are serious about porter welfare. The route past 5 Gokyo Lakes is a less frequented trail, which is ideal for the experienced trekker. Your first stop is the bustling capital of Nepal, Kathmandu. You have time to wander the narrow streets here, and will be able to discover the temples and Stupa that provide much intrigue in this fascinating city. After exploring Kathmandu you fly to Lukla from where your trek to Everest commences. You trek first to Namche Bazar, and from there you take a different route to Base Camp itself. From Namche Bazar, you follow the trail upwards to Dole and Machhermo through rhododendron and magnolia forests on your way to Goyko. As you are trekking the remote Gokyo Lakes and Nilbuk Caves are just some of the incredible views you will see. On arrival at the small village town of Gokyo you have a day for acclimatization, here you climb Gokyo Ri and marvel at the surrounding views, before continuing onwards and upwards. One of Adventure Pilgrims Trekking's respondent will pick you from airport and transfer to hotel. Introduction about Nepal and the experienced trekking guide and short briefing about your trekking trip from the guide.In the evening, you'll have free or optional Nepalese Cultural Program with dinner. You have a scenic flight of 30 – 35 minutes to Lukla (2800m) from Kathmandu. In Lukla you can see the airline office and numerous lodges. The trail from Lukla leads you to Chablung (2700) and it descends steeply to the Tharo Kosi which is also known as Kusum Kangru Khola (river). Beyond the Tharo Kosi Bridge, the trail climbs to Ghat (2590) and again climbs to Phakding. In Phadking you can climb to the Gompa to see your first view of the high peaks. 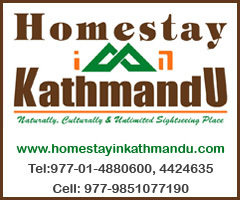 Now you will really feeling like you have arrived in the Himalayan Kingdom. Stay Overnight. From Phakding the trail follows the Dudh Koshi River and reaches Zamphuti. From here you can see excellent views of Thamserku peak. Then the trail climbs to Chhamuwa, the site of an agricultural project, an interesting place to have a look around and gain an insight into the farming way of life of these people. From Chhamuwa, the trail again climbs to Monjo (2835m) and enters the Sagarmatha (Everest) National Park (1148sq km, established in 1976). Walking some distance up hill you will be at Jorsalle (2740m) and after a long climb with views of Mt. Everest peeking over the ridge of Nuptse (7,861 m) the trail reaches the street of Namche Bazaar. Stay overnight. After having breakfast take some sightseeing around Namche Bazaar. 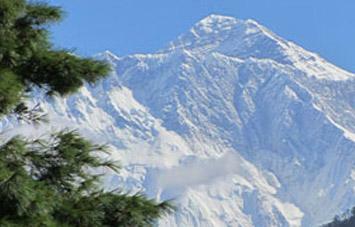 Then you can hike to the Everest View Hotel, the ideal place to overview some of the outstanding mountains such as Mt. 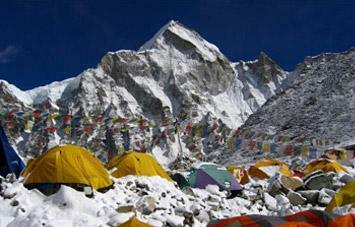 Everest(8848 m), Ama Dablam(6856m), Thamserku(6608m), Lhotse(8414m) etc. Make sure you have your camera to capture this moment. You can walk around the Khumjung valley, Hillery School and Khunde Hospital and then return back to Namche. In the centre of Namche you can visit the mountaineering museum and visit the Sagarmata Pollution Control Committee (SPCC). In Namche Bazaar you can spend some time interacting with the fun-loving Sherpa and Rai people. In Namche above the police check post you will see Sagarmatha National Park headquarters and if you want to look at the visitor centre it is open from 8am to 4pm except Saturdays and holidays. Stay overnight. Climbing the hill to Khumjung, turning the north Gokyo route you can reach to Mong (Mohang) which is known as the birth place of the Saint Lama Sanga Dorje, the reincarnation lama of Rongbuk Monastery. The trail descends to the Dudh Koshi and enters at Phortse Thanga. Stay overnight. The trail climbs steeply through rhododendron forests, passing many Kharkas on its way to Tongba (3950m) and Gyele (3960m) and finally Dole. Stay overnight. The trail climbs through a huge rock at Lhabarma (4330m) and carries on to Luza (4360m).From Luza the trail continues to climb to Machhermo (4470m) where you can have good views of the mountains. Stay overnight. Passing through Machhermo the trail climbs and reaches Pangga (4480m). Beyond Pangga the trail drops and again climbs steeply. From there you can see the massive Ngozmpa Glacier and finally you arrive at Gokyo. Stay overnight. After having breakfast you can take a look around Gokyo valley. If you want to observe the best view you have to climb Gokyo RI (5360m) which is also called Kala Patthar but not the Kala Patthar above Gorakshep. From here you have panoramic views of Cho Oyu (8188m), Gyachung Kang (7,952 m), Everest, Lhotse (8414m), Makalu (8,481 m), Cholaste and Tawachee. Stay overnight. From Gokyo the trail descends to Phortse, climbing across the terminal moraine of the Ngozumpa Glacier and making Afew ups and downs the trail enters Phortse. Stay overnight. The trail descends from Phortse to the bridge at Phortse Thanga and rejoins the original route from Khumjung and then brings you to Namche Bazaar. Stay overnight. Trek back to Lukla. Stay overnight. Fly back to Kathmandu. Sometimes the flight may be delayed or cancelled due to bad weather condition for which you should be very patient. We allow a Leisure day in Kathmandu Incase the flight from Lukla is canceled due to weather. or you can join us to our other activities like White Water River Rafting, Jungle Safari, Annapurna Region Trekking, Nepal Tour and many more. As we are saying farewell to Nepal for this trip, we will drop you to the airport for your safe journey to your sweet home . Drinks, beverages, hot water,drinking water, battery charges, phone calls etc. Cost rise due to weather problem. In Case of emergency , your personal travel insurance includes your helicopter rescue, trip cancellation and medical expenses.